If you spot your cat munching on rubber bands, pica may be to blame. Some cats like to eat weird things, and some cats like to eat really weird things. If you notice that your cutie has a penchant for eating rubber bands, instead of dismissing her behavior as simply zany, consider that she may be dealing with pica, a compulsive eating behavior. Pica is a condition characterized by unusual eating patterns. If you routinely catch your fluff ball eating -- or at least chewing on -- inedible things, the compulsive disorder may be the culprit. Apart from rubber bands, felines with pica may sink their teeth into wool, plastic bags, plants, towels and paper, amongst many other non-food items. Pica often can be dangerous. For example, cats who attempt to eat electrical cords may subject themselves to potential electrocution -- yikes. 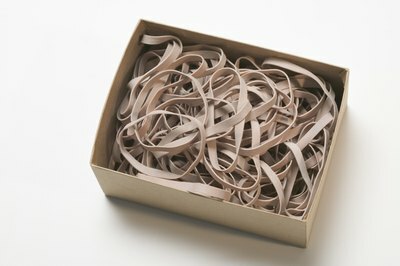 According to the Feline Advisory Bureau, rubber bands are some of the most common "weird" items that cats enjoy eating. So if you think your cat is an oddball, at least she's not totally alone! The ASPCA indicates that compulsive eating behaviors may be related to stress and annoyance. If your kitty suddenly develops a taste for rubber bands, it may be a substitute for something else that she would rather do. Maybe she's impatiently waiting for you to give her some of her favorite crab and tuna snack treats, so in the meantime she's going to sink her teeth into the rubber bands lying around on the living room table. It may sound nonsensical to you, but cats are sometimes pretty wacky -- yet utterly lovable -- creatures. If your cat is feeling kind of lackluster about her life, she may turn to eating and chewing on rubber bands as a form of entertainment. This may be a sign that the poor thing isn't getting enough attention from the people in her life, or perhaps that she needs some more interesting and engaging interactive toys to focus on. If your cat is obsessively eating rubber bands, get her to the veterinarian immediately, as the behavior could be associated with various underlying health conditions. For instance, the freaky eating preference could point to nutritional deficiencies in your cutie's diet -- think insufficient fiber or fat. If your cat's body is not getting the essential nutrients that it needs, her cravings may lead her to try to find them elsewhere. Pica also could be a sign of various medical disorders in felines, including leukemia, diabetes and feline immunodeficiency virus. Because of these potentially harmful possibilities, don't assume that her rubber band adoration is just a phase. Also, for the sake of your kitty's health and well-being, always keep rubber bands out of her reach. Carefully comb through your entire home to ensure that she can't access any of them. What Does It Mean if a Cat Is Eating Hair? What Are Weird Things Cats Eat?